Learn the most effective Standup striking martial art ever created! Muay Thai Kickboxing is considered the most effective of all the striking Martial Arts. 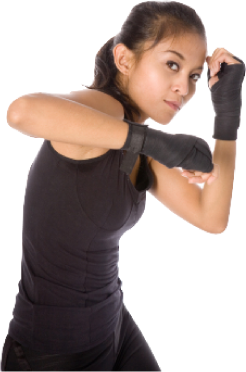 In addition to a very effective method of self defense, it is also considered an effective weight loss activity. This 1000 year old martial art system is world renowned for its simplicity and effectiveness. It is an art form which utilizes all of the body's natural weapons to create a devastating fighting style. In Kickboxing, hand techniques are similar to boxing, adding strikes with elbows and knees, and delivering low, powerful kicks. Welcome to Absolute Martial Arts. We have many different classes to fit one’s needs such as Muay Thai Kickboxing technique class, Kickboxing pad classes, flexibility classes, and sparring classes. We also offer lessons in Brazilian Jiu Jitsu, Boxing and MMA. Since our establishment, Absolute Martial Arts has strived to provide high quality instruction, with a focus on a positive and safe learning environment. Our instructors understand that everyone has the desire to get in great shape, learn how to defend themselves, and at the same time avoid injury. Our workouts have a proven safety record that will enable students to train in a safe, fun, and controlled class setting. We teach authentic Muay Thai Kickboxing. Absolute Martial Arts is the only school in St Louis that has trained and been certified under Grandmaster Toddy, who is respected all over the world as the authority in the art of Muay Thai Kickboxing. Our Muay Thai program is designed around Grandmaster Toddy’s Muay Thai International Association (MTIA) curriculum; an award-winning system of authentic Muay Thai! Our proven Kickboxing program can help you feel more energized while helping you get into better shape, relieve stress, and more alert. Kickboxing can also empower you by giving you the confidence in knowing you could defend yourself or your family if necessary. This class focuses on the fitness, technique, and conditioning aspect of Thai Boxing. It combines high intensity training drills, calisthenics, and pad drills. Students will learn to punch, elbow, clinch, knee, and kick. This provides a challenging workout and at the same time develops functional self defense. One of the hardest parts of martial arts is starting your first class. Some people are worried to try martial arts for fear they will get hurt. That's why we teach every class in the safest manner possible. Since we work with students from all walks of life daily, we have developed an intelligent and respectful approach to training. Our environment is non-competitive, safe and challenging. Perfect for the adult seeking a fun and challenging workout. Muscle and Fitness magazine rates kickboxing as the number one fat burner with over 800 calories burned in a class. 800 CALORIES!! Did you ever notice how boxers have very toned bodies? They look like they spend hours lifting weights, when the truth is, they hardly lift any weights at all. That's the same look you'll get from Muay Thai Kickboxing . You'll get toned legs, a flat stomach, and a stronger body. Our students tell us "stress relief" is one of the top reasons why they cannot get enough Kickboxing . Because of the mental strength the martial arts develops, students get so absorbed in the class, their problems seem a million miles away. The best part is you'll think clearer, sharper and with more confidence than ever before. We all know that when you look good, you feel good. Imagine adding, "And I know how to take care of myself," to the equation. There is no better feeling than knowing that you are in great shape and can defend yourself if you ever had to. We understand that our students are not training for a real kickboxing match. Most just want to have fun and get in the best shape of their lives. That is why we use the latest, most progressive teaching methods available. Are you training for self-defense? Are you just looking to improve your fitness level and drop a few pounds? You will spend about 30 minutes learning the basics behind the Muay Thai fighting style, putting you on the fast-track to get ready for regular classes and giving you a good idea as to what to expect, and to what it will take to be successful. If you already have experience, the instructor will use the session to determine your level of competency in order to ensure you receive the proper training once you start regular classes. WHY choose absolute martial arts? At Absolute Martial Arts, we guide you through a step by step system of Muay Thai kickboxing. Muay Thai is an exciting, high-impact system that will provide you with valuable self-defense skills, while you get in great shape and have fun. The secret of Absolute Martial Arts’ success lies behind the fantastic atmosphere in the school that is generated by the shared enthusiasm from both the instructors and students. These are some of the keys to picking the right Muay Thai Kick boxing school. Many people wind up going to a poorly qualified school and having such a bad experience that martial arts is something that they give up on and never try again. What most people don’t realize about martial arts is that getting the benefits of fitness and self-defense has as much to do with the instructor as the style itself. This is why finding a highly qualified Muay Thai school in St Louis is so important. Clean Facility: Absolute Martial Arts is one of a kind. A 6,800 square foot facility with two large mat areas, MMA cage, Boxing ring, heavy bags, and more. Plus, we are the cleanest school in St Louis- we disinfect our mats with hospital grade disinfectant. We are one of the only gyms in St Louis that takes mat cleaning seriously. All you have to do to get started is fill out the form above. You'll be taught the step-by-step basics of Muay Thai in your first lesson. Don’t worry, you won’t get thrown in the deep end. It’s a really relaxed environment, and you have nothing to worry about, except have a great time! Hope to see you here soon!